Go about 8-9 miles until you see Kitchen Table & JJ's Convenience Store. Just before the restaurant you will bear left onto Cheohee Valley Road. Follow this road for about 6 miles until you see the sign at the entrance of the Piedmont Forestry Center on your left. Turn left into the driveway and go through the gate. Follow the road down the hill then turn left towards the large building just below the pond. Turn RIGHT at the gas station onto N. Little River Road (SC S 37 57) at the Piedmont Forestry Center Sign. About 1.5 miles turn RIGHT onto Cheohee Valley Road. 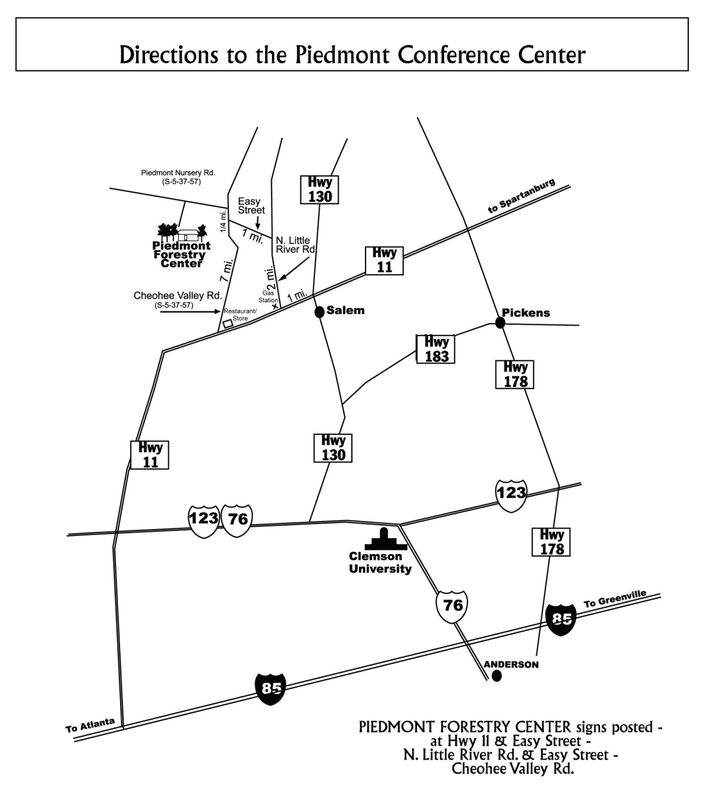 The entrance to the Piedmont Forestry Center will be on your LEFT a short distance ahead. Turn left on Hwy. 11 and go approx. 65 miles to N. Little River Road. You will cross Highways 176, 14, 25, and 178 – stay on Hwy. 11. Turn RIGHT onto Highway 130 and follow 130 through Salem until you reach Highway 11. Turn LEFT onto Piedmont Nursery Road. Take Interstate I-26 toward Asheville. Take Exit 5 (Hwy. 11) and turn LEFT towards Campobello. The entrance to the Piedmont Forestry Center will be on your LEFT ¼ mile ahead.